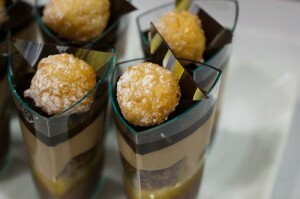 Dessertbuzz | Top 10 Pastry chefs of 2010 Part V: Frank Vollkommer from upstate NY! Frank Vollkommer was clearly not put off by having to bring 300 servings of a dessert to the Top 10 Pastry chefs of 2010 awards where he was being honored. In fact, he actually brought two different items, neither of them very simple. And if that wasn’t enough, he also brought some handmade chocolates as well. 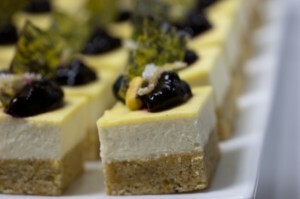 The first item, a pistachio financier with vanilla parfait, lemon custard and rosemary infused blueberry compote, was a real crowd pleaser based on the comments from the attendees standing near me. “Not too sweet” and “this one in the glass is to die for” were two comments I wrote down while i was setting up the DessertBuzz video crew. The second item which was designed by his wife Jessica, was a parfait with tropical soft ganache, passionfruit marmalade, buttermilk chocolate cake and milk chocolate mousse (!). Jessica is also a chef and partner in the Chocolate Mill pastry chop and cafe in Glens Falls, NY where they both work. Check out the video where Frank explains the ingredients and what inspired these desserts. Part I featuring photos of each of the top 10 honorees is here. Part II featuring Nicholas Lodge of the French Culinary Institute of Chicago is here. Part IV featuring executive pastry chef Yannis Janssens of the Fontainbleau resort in Miami Beach in here. With havin so much content and articles do you ever run into any problems of plagorism or copyright infringement? My site has a lot of completely unique content I’ve either written myself or outsourced but it seems a lot of it is popping it up all over the web without my authorization. Do you know any techniques to help prevent content from being ripped off? I’d certainly appreciate it.